A man known as “the Piggyback Bandit” apparently attended three high school sporting events in the D.C. area in the past week. A meeting was held Thursday night at a local high school after reports that Sherwin Shayegan may have been in the locker room during Tuesday night's varsity basketball game between Good Counsel High School and St. John's College in the district. A Good Counsel parent told News4 a man fitting Shayegan's distinctive description stood behind the visitor's bench, poured water for players, and even went into the locker room at half-time and gave some shoulder massages. That parent says everyone assumed he was there in some official capacity. Good Counsel basketball parents met with coaches to discuss ways to prevent something like that from happening again. Over the weekend, Shayegan allegedly grabbed the arm of a player at a high school hockey game in Ashburn, Virginia, authorities said. He then tried to get the player into a locker room, investigators said. A man known for seeking piggyback rides from high school athletes across the country is accused of assault in Virginia. Scott MacFarlane reports. He also showed up at a basketball game at Kettle Run High School Monday evening, according to the Fauquier County Sheriff. He stood behind one team's bench and acted like a team manager, providing water and folding jerseys. He may have entered the Freedom High locker room and approached players, according to the sheriff. Officials told him to leave the school, and he did. Shayegan, 31, has been accused in similar incidents across the country. He is known for seeking piggyback rides from high school athletes. According to news accounts, Shayegan, originally from Seattle, has spent years traveling from state-to-state, sometimes earning money by panhandling. Investigators have found he sets up residence, then begins researching local high school men's athletic teams on the Internet. He goes to games often pretending to be a trainer for the visiting team to escape the scrutiny of home-team parents. According to KING 5 in Washington state, where Shayegan used to live, he was banned from high school sporting events in five states because of his antics. "Shayegan's antics stretch back to 2008 and had been mainly confined to Washington and Oregon. But since last fall, he has worked his way east to Montana, North Dakota and Minnesota, leaving a trail of befuddled athletes in his wake. "Shayegan has asked for piggybacks, attempted to pay for piggybacks and just sprung one upon an unsuspecting kid. He favors basketball games, but he also has leapt onto hockey, soccer and football players. "He has pretended to interview athletes for a term paper, acted as a team manager or just tried to blend in with the crowd for a piggyback payoff." Shayegan is charged in Loudoun County with assault and battery. 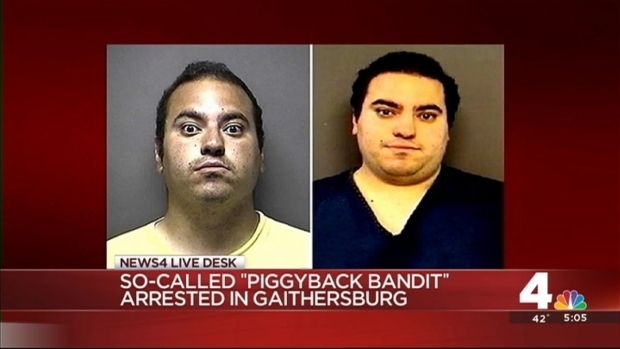 He was arrested at a home in Gaithersburg, Maryland. His mother has told reporters her son has Asperger's syndrome and is compulsively reliving his years as a high school sports team manager.